GAO-17-543: Published: Jun 22, 2017. Publicly Released: Jul 24, 2017. The U.S. 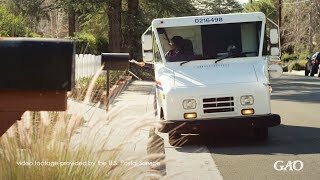 Postal Service has monopolies on delivering letters and accessing mailboxes, which were designed to protect its revenues and help it provide universal service. However, its net losses reached $5.6 billion in fiscal year 2016--and have topped $62 billion over the past decade. The Watchdog Report podcast goes on location to talk about potential changes that could help the Postal Service fulfill its mission. The U.S. Postal Service has monopolies on delivering letters and accessing mailboxes, which were designed to protect its revenues and help it provide universal service. However, its net losses reached $5.6 billion in fiscal year 2016--and have topped $62 billion over the past decade. We looked at potential changes that could help the Postal Service fulfill its mission. The value of the U.S. Postal Service's (USPS) letter delivery and mailbox monopolies was $5.45 billion in fiscal year 2015, according to the most recent estimate prepared by the Postal Regulatory Commission (PRC), the regulator of USPS. This figure suggests that USPS's net income would decline by this amount if its monopolies were eliminated. To develop these estimates, PRC identifies the mail covered under USPS's monopolies for which a potential entrant might compete to provide service if the monopolies were to be eliminated; such mail is referred to as “contestable.” PRC's estimated value of these monopolies has increased substantially in recent years—it was $3.28 billion in fiscal year 2012—and PRC staff expects that the value will continue to increase in the next few years due to increased volumes of contestable mail. Narrowing or eliminating USPS's letter delivery and mailbox monopolies would likely have varied effects, according to views provided by postal stakeholders, experts, USPS, and PRC. For example, all parties agreed that allowing other entities to deliver letters could decrease USPS's revenues, and that additional strain would be placed on USPS's ability to continue providing the current level of universal service. Additionally, some stakeholders said that allowing other entities to deliver items to the mailbox could adversely affect the security of mail and increase clutter that would impair USPS's delivery efficiency. On the other hand, most of the postal experts we interviewed said that allowing entry to this market by private competitors could result in increased competition that would spur USPS to become more efficient. Officials from foreign posts or regulators in all six of the countries GAO contacted reported increases in competition after ending their postal delivery monopolies, and some of these countries also reported losses of revenue and market share for the carriers providing universal service. Stakeholders, experts, foreign officials, and USPS agreed that postal policies are interdependent and therefore need to be considered in tandem with one another; officials from all six countries we contacted told us that concurrent postal policy changes, such as increasing a post's degree of commercial freedom or decreasing the scope of its universal service obligation, assisted their transitions away from postal monopolies. Estimating the effects of laws that apply differently to USPS and its private competitors would require steps including defining appropriate study objectives and assessing scope and methodological tradeoffs. For example, objectives would need to clarify the extent of financial effects to be estimated—whether for USPS as a whole, for only specific products, or for USPS relative to competitors. Scoping decisions would need to define the specific areas to be studied, the period of time to be reviewed, and the type of data to be collected. This would involve multiple considerations, including determining which laws to include and how to address differing stakeholder views. Additional judgment would be needed to address any lack of consensus on methodologies and to determine the appropriate degree of time and resources. For example, a comprehensive study estimating the effects of every law would require significant time and resources; if estimates were desired in a shorter time frame—or if financial resources were limited—tradeoffs would be required. USPS's mission is to provide universal delivery service while operating as a self-financing entity. Congress has provided USPS with monopolies to deliver letter mail and access mailboxes to protect its revenues, which enables it to fulfill its universal service mission, among other reasons. Despite its monopolies, USPS's poor financial condition has placed its universal service mission at risk. USPS's net losses were $5.6 billion in fiscal year 2016 and were greater than $62 billion over the past decade. GAO was asked to review the postal monopolies. This report examines (1) what is known about the value of USPS's letter delivery and mailbox monopolies, (2) views on the potential effects of narrowing or eliminating these monopolies; and (3) considerations that would need to be addressed to estimate the effects of laws that apply differently to USPS and its private competitors. To address these questions, GAO reviewed reports issued by PRC and others; obtained views from USPS and PRC, as well as postal stakeholders and experts who have submitted public comments to PRC proceedings; and collected information from six countries—France, Germany, Italy, Japan, Sweden, and the United Kingdom—that have eliminated their postal monopolies, selected based on criteria including their share of global mail volume. GAO is making no recommendations in this report. USPS disagreed with some stakeholder perspectives, among other things. GAO believes that the information is portrayed in a balanced way and added USPS responses, where appropriate.